Mohmad (middle) with Sabah Police Commissioner Datuk Omar Mammah (third left), Senior Assistant Commissioner Zulkifli Ali (sixth left), Tawau district police chief ACP Fadil Marsus (second left) and senior officer with the seized drugs at Tawau Police Headquarters. 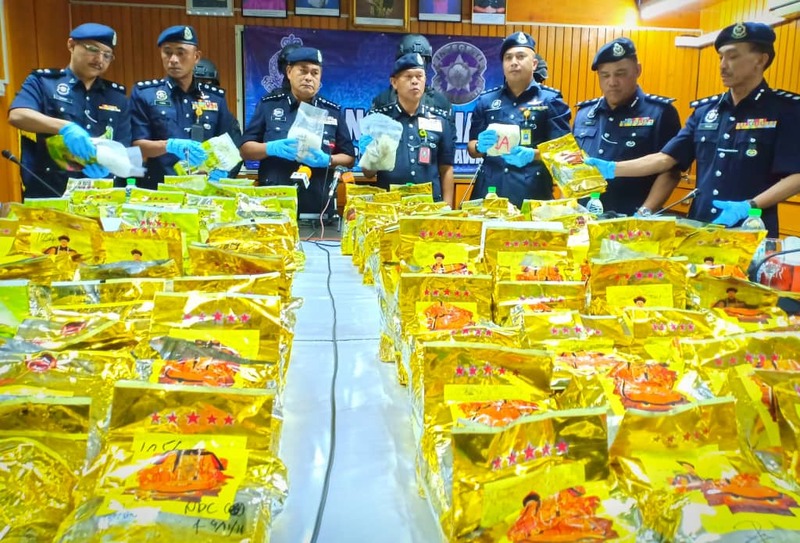 TAWAU: The Sabah Contingent Narcotics Criminal Investigation Department has crippled a drug trafficking syndicate with the arrest of four local men and seizure of 104.3 kg of syabu worth RM5.2 million. Narcotics Criminal Investigation Department director Datuk Seri Mohmad Salleh said today that two raids were made around Tawau on Nov 9 between 12.30pm and 1.45pm. He said four local men from Kuala Lumpur and Johor aged 31 to 39-years-old were arrested and also seized were Malaysia and Singapore currencies worth RM2,000. The drugs sealed in tea packets, he said are meant for local and neighbouring market, and police is still investigating modus operandi of the drugs were brought in either by air courier or passenger. Mohmad said the seizure is the biggest for Sabah since the narcotic department was formed in 1996 and for the past two months for October and November teh department succeed in seizing a total of 167 kgs of syabu, Lahad Datu (52kgs), Semporna (11kgs) and Kota Kinabalu (4kgs). All suspects are remanded under section 117 of the Criminal Procedure Code for further investigation under section 39B of the Dangerous Drugs Act 1952.